Customized options are available: If you are interested in including the One-Handed Windlass CAT TOURNIQUET in your kit vs. the SWAT Tourniquet, please call us at 800-277-3727. The instructional card provides of picture of a human body that is color coded making it simple and easy to match the wounded area(s) of the body to the correct trauma product. Additionally, the directions on how to use each product are listed and easily explained on the card. Our ER™ digital training presentation, teaches how, why and where to use each blood stopping product. Concise directions are included in the form of written instructions, training videos and color pictures. The video is repetitive and thorough so our customers can not only learn how to use the products, but also grow confident in using them in a life threatening situation. Why is this kit important? The Federal Bureau of Investigation did a study on Active Shooter Incidents from 2000 to 2015. The study found that “The threat of Active Shooter incidents is increasing with the average being 17.6 /year which is three times higher than that of the first 5 years (5.2/year)." Severe uncontrolled bleeding can kill within minutes. The Blood Stopper Trauma complies with TCCC (Tactical Combat Causality Care) regulations to effectively treat combat victims. The TCCC Standards are endorsed by both the American College of Surgeons and the National Association of EMT’s as an effective method to treat medium to severe penetrating body wounds. 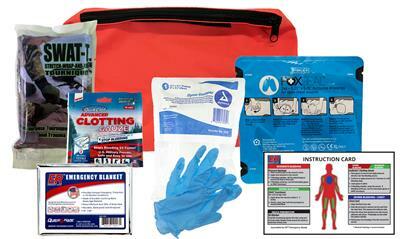 The items in this kit meet and surpass the standards set forth by Homeland Securities "Stop the Bleed" Committee. The ER™ Blood Stopper Kit contains Hemostatic "Blood Clotting" Gauze, Tactical Tourniquet, Chest Seals and other critical medical supplies for the treatment of moderate to severe uncontrolled bleeding caused by penetrating wounds. This kit is designed to enable non-emergency personnel to deliver life-saving treatment to an injured victim until EMS can arrive on scene. The kit includes a color-coded instruction card and an instructional/training video link. Packaged in a Neon Orange zippered pouch with a transparent front for increased visibility. Customized options are available: If you are interested in including the CAT TOURNIQUET in your kit vs. the SWAT Tourniquet, please call us at 800-277-3727.